New technologies that make the worldwide deployment of photovoltaics increasingly economical. A tremendous rate of innovation. And a unique and diverse product range. SMA Solar Technology has been among the most successful companies in the solar technology field for over 30 years. A team of engineers and technicians develop state-of-the-art solar inverters – the heart of every photovoltaic power system. 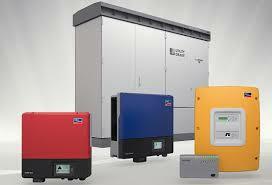 The appropriate inverter for every application. SMA, as the worldwide market leader, develops, produces and distributes solar inverters and monitoring systems for photovoltaic power plants. Since every PV system has to be individually designed, SMA has a broad product range: SMA is the manufacturer to offer the appropriate inverter for every requirement, worldwide – whether for grid connection, stand-alone supply or back-up operation. From kilowatt to megawatt. For all module types – whether thin-film, crystalline or concentrator technology. The inverter is technologically the most important component in any solar power system: It converts the direct current generated in photovoltaic cells into alternating current suitable for the grid. In addition, it is also responsible for yield monitoring and grid management as an intelligent system manager. Solar inverters from SMA feature a particularly high efficiency: and therefore makes greater electricity production possible.